Dallas hotels are renowned for their world class comfort and amenities, providing guests with top of the line service that leaves them wanting for nothing. Whether in town for business or for pleasure, these hotels make their guests feel like they are home, providing them with opportunities to relax and work as they please, without having to worry about their personal needs or concerns. Plush accommodations and posh amenities that include an infinity pool and an on-site spa are among the highlights of The Highland Dallas Curio Collection by Hilton. The nine-floor 198-room Highland features eco-chic rooms are outfitted with rich textiles and decadent marble bathrooms sporting designer vessel sinks and luxurious soaking tubs. An easy recycling setup appeals to the environmentally conscious while luxe details include pillowtop beds. Swimmers enjoy the outdoor heated infinity pool open year-round. Pets are permitted. Just across the way from Southern Methodist University The Highland Dallas puts guests between the upscale and vibrant Lakewood and Park Cities districts. Those on the lookout for a safe scenic place to jog will love that Katy Trail is within a three-minute drive. Central attractions like the Dallas Convention Center Sixth Floor Museum Dallas Museum of Art and Dallas World Aquarium are a 10-minute drive. Dallas/Fort Worth International Airport is 24 miles from the hotel while Dallas Love Field Airport is four miles away. our guests love the "great" location and on-site amenities at the Highland Dallas Curio Collection by Hilton and "would definitely stay here again." For a full-service hotel close to Cowboys Stadium the Sheraton Arlington Hotel is popular with our business guests and pleasure seekers alike. All 311 rooms at the 19-story Sheraton are non-smoking and boast contemporary furnishings plush bedding and dual-line phones. Rooms also include plenty of workspace and ergonomic desk chairs. Wi-Fi is available in all accommodations for a fee. There's a fully-equipped business center for road warriors and a full-service American-style restaurant for hungry guests. Head to the lounge for a taste of signature cocktails and light Southwestern meals. The hotel underwent a total renovation in 2010 and 2011 and the results are plain to see. The sounds and sight of water surround you from the fountain cascading outside the meeting room to the seasonal outdoor pool and patio area with lagoon. The hotel hosts dive-in movies each night from Memorial Day through Labor Day when weather permits. The Sheraton is the closest full-service hotel to Cowboys Stadium which is a mile-and-a-half away. Next to the Arlington Convention Center it's only a half-mile from Texas Rangers Ballpark and a five-minute drive from Six Flags Over Texas. Dallas/Fort Worth International Airport is 13 miles away. our guests at the Sheraton Arlington Hotel enjoy "amazing" beds a "beautiful" pool area and prime "walking-distance" access to Rangers Ballpark. Wi-Fi and airport shuttle service are free and guests enjoy well-equipped rooms and an indoor pool at the non-smoking Magnolia Hotel Dallas Park Cities just north of downtown Dallas. The mid-rise Magnolia Hotel is a non-smoking property and offers 292 comfortably appointed rooms that include free Wi-Fi 37-inch flat-panel TVs and coffeemakers. Dine in with room service or step out to the hotel restaurant and bar. There is also a small market where you can buy snacks and necessities. After getting work done in the business center or gym take a dip in the indoor pool. Airport shuttle service is free. The Magnolia is right off Highway 75 10 minutes north of downtown Dallas. Southern Methodist University and the George W. Bush Presidential Library are just across the highway and guests can shop dine or see a film at Mockingbird Station about two blocks away. Top picks within 10 minutes include the Sixth Floor Museum/Texas School Book Depository the Perot Museum of Nature and Science and events at the American Airlines Center. Transportation options include the bus a half-block from the hotel the light rail at Mockingbird Station and Dallas/Fort Worth International Airport 28 miles west. The hotel provides free shuttle service to Dallas Love Field Airport five miles away. our guests appreciate the convenient location close to the railway station and take special notice of the friendly staff comfortable beds and attractive public spaces at Magnolia Hotel Dallas Park Cities. With a free airport shuttle and the most heavenly beds Westin Dallas Fort Worth Airport earns high marks from our guests who appreciate its style and comfort. The 15-floor Westin aims to impress with 506 sophisticated and contemporary rooms that include signature beds free WiFi access flat-panel HDTVs with pay-per-view movies spacious work desks and ironing facilities. The hotel restaurant serves breakfast and dinner and there's a cocktail lounge and a cafe with Starbucks on tap. The hotel's outdoor rooftop houses a heated pool that's open seasonally from April through November. There's also an in-house gym. Self-parking and valet parking are available for an additional fee and airport shuttle service is free. Dogs are allowed also for a fee. Westin DFW Airport puts guests at the prime midway point between the airport and Irving's prized community — Las Colinas where Fortune 500 companies are business as usual. You're a five- to 10-minute drive to heavyweights like Commercial Metals Zale Corporation and ExxonMobil. Grapevine Lake a 20-minute ride makes for a great outdoor escape. If thrill rides are more your speed you can be at Six Flags Over Texas in 25 minutes. Dallas/Fort Worth International Airport is about two miles from the hotel. Impressed with the "best beds ever" and the "cool" rooftop pool our guests recommend a long layover at Westin DFW Airport Hotel. 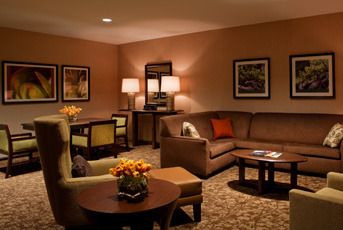 Free hot breakfast weeknight receptions add extra value to a stay at the non-smoking Wingate by Wyndham Dallas/Las Colinas one of the most popular hotels in Irving among our guests. The three-floor Wingate has 100 rooms all with coffeemakers and 42-inch LCD TVs. Chill it out or heat it up in the mini-fridge and microwave. The plush beds have pillowtop mattresses and are triple-sheeted with cotton-rich linens. Select accommodations have jetted tubs. A free hot breakfast starts your day with a rotating menu of egg patties sausage or bacon waffles potatoes toast bagels muffins pastries cereal fruit yogurt coffee juice and more. The weeknight reception offers complimentary beer wine soft drinks and snacks. The hotel has a fitness center and a laundry facility on-site and parking is free. The Wingate is located eight miles southeast of Dallas Fort Worth International Airport. The Sixth Floor Museum at Dealey Plaza Reunion Tower and other downtown Dallas attractions are about 13 miles southeast. Winning hospitality is just part of the package of extras at this Wingate by Wyndham Dallas/Las Colinas which gives our guests free food plush beds and a complimentary shuttle. Offering a bar with craft beers and a heated rooftop pool the non-smoking Westin Dallas Park Central works for guests on the go. This 20-floor non-smoking hotel has some highly appealing amenities and comforts from a 24-hour business center to 24-hour room service to satisfy your craving for a juicy burger at 3AM. Whether taking a dip or just taking in the stunning views of downtown guests find the rooftop pool a great hangout. More enjoyment is served up at the hotel's two on-site restaurants and bar with local brews on tap. The 536 rooms are outfitted with signature bedding flat-panel TVs plush chairs and ottomans and multi-level desks with easily accessible plug-ins. Right off I-635 in Dallas' Richardson/Garland neck of the woods the Westin puts guests a 20-minute commute north of downtown. In the immediate area are draws like Texas Instruments a five-minute ride and Richland College a 10-minute trip. Southern Methodist University and Raytheon's local operations are within a 15-minute ride as well. Dallas Love Field Airport is 11 miles from the hotel while Dallas/Fort Worth International Airport is 19 miles away. Impressed with the "handsome" decor "pleasant" surroundings "comfortable beds" and "very good staff" our guests also appreciate how highly convenient Westin Dallas Park Central is to I-635. Offering a free airport shuttle cloud-like beds and fine wining-dining Sheraton DFW Airport Hotel scores high with our guests who appreciate its snazzy new style. The 12-floor 300-room Sheraton wrapped up a ground-level transformation in 2010 and now features a swanky new lobby [email protected] high-tech station fitness center outdoor heated pool gourmet restaurant and sports bar with billiards. The rooms aren't anything to sneeze at either. They're decked out with rich touches like leather headboards plush pillowtop signature beds Art-Deco-inspired furniture and 37-inch flat-panel TVs. Make the most of your space with room service or indulge in a fancy-pants meal at the hotel's upscale restaurant (don't miss its renowned wine collection). They've got top-notch pub grub too. In the morning visit the cool colorful cafe for a cup of Starbucks. Parking is free and there's a complimentary airport shuttle. The Sheraton is 10 minutes away from Las Colinas one of the area's most prestigious neighborhoods and home to Fortune 500 heavy hitters like ExxonMobil and Kimberly-Clark. 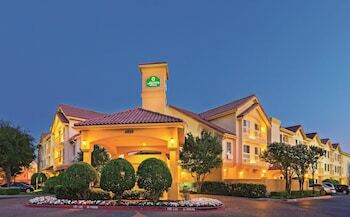 Business travelers will be grateful that Grapevine Convention Center is just a 15-minute trip. Given the central Irving locale major league fans can make it to Rangers Ballpark in Arlington or catch a Mavericks game (or concert) at American Airlines Center in Dallas in 25 minutes' time. Dallas/Fort Worth International Airport is about three miles away. "Incredibly comfortable" beds and a "handy" free airport shuttle along with major high-style renovations leave our guests highly satisfied with Sheraton DFW Airport Hotel.